It’s mid-August, and I’m in the midst of preparing for the upcoming school year, so I don’t have time for a long blog entry right now. However, I couldn’t resist passing on this lovely poem by Alcman, a (male) Spartan lyric poet from the 7th century BCE. I thought it might be of particular interest to all of us who are teaching either the 5th or 10th grade, since in Waldorf schools, those are the years that we focus on Greek history. However, as is well-known, Spartan girls were different. 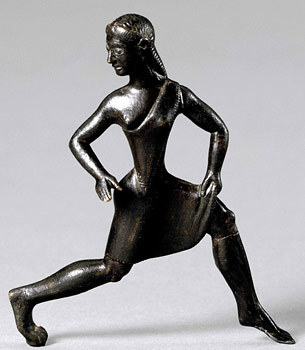 Spartan women were given much greater liberty than in other Greek city-states; they were even encouraged to exercise heartily and dance in public. Of course, all this was for the greater aim of making them strong, healthy child-bearers for the State–not exactly the same goals we have in mind when we encourage our daughters and students to develop their physical abilities. But if we’re looking for pictures of a free, relatively uninhibited (for the time period) ancient Greek girlhood, look no further than Sparta. Alcman’s poem is precious to us in this regard–he not only extols the beauty of two individual Spartan girls (Agido and Hagesikhora), he also gives us a wonderful picture of girls as a group racing (presumably in a foot-race), and the crowd cheering them on, often by name. Another terrific aspect of the poem is his imagination that he himself is one of the girls in the choir singing at the race. Such a beautiful, awe-inspiring picture! Without further ado, then, here is the poem. It is a part of a longer piece, of which much is just in fragments. Luckily for us, the part that survives the best is the part about the girls. 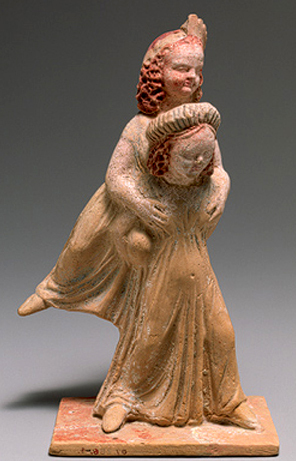 The translation comes from this excellent site that focuses on women and gender issues in the ancient world. The witness of its radiance. A horse that runs in dreams. Flowers around her silver eyes. What can I say to make you see? In the races at Ibeno. Which we have brought to the goddess. In the honey and spice of a summer night. Nor our sweet violet eyes. She honors the rites with her beauty. Am but an ordinary girl. I hoot like an owl in the roof. Enjoy the rest of your summer. To my fellow-teachers, bon courage in the weeks ahead! Thanks, Rosemary! So glad you enjoyed them. I was particularly moved by the statue of the two little girls playing piggyback.